Such signs are positioned only where animal crossings are very likely - but they could happen anywhere. 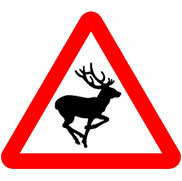 Peaks in deer vehicle collisions occur October to December and also in May. Highest-risk times are from sunset to midnight, and the hours shortly before and after sunrise. During danger periods or on roads where hitting a deer is a possibility, drive with caution at or below the posted speed limit. Be aware that further deer may well cross after the one you have noticed, particularly during the mating season, but also where deer are in herds. After dark, do use full-beam when there is no opposing traffic. The headlight beam will illuminate the eyes of deer on or near a roadway and provide greater driver reaction time. BUT, when a deer or other animal is noted on the road, dim your headlights as animals startled by the beam may ‘freeze’ rather than leaving the road. If a collision with the animal seems inevitable, then hit it while maintaining full control of your car. The alternative of swerving into oncoming traffic or off of the road surface could be even worse. Motorcyclists, are at particular risk when in direct collisions with animals. Only brake sharply and stop if there is no danger of being hit by following traffic, use your hazard lights. Try to come to a stop as far away from an animal as possible to enable it to leave the roadside without panic. If you see an injured deer on the roadside?